Blogging from the wilds of New Jersey - ain't modern technology grand? 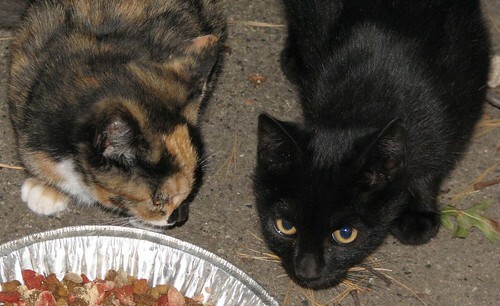 These are the feral kitties my mom's been feeding. There were five - a mom, dad and three kittens, but the others have disappeared under mysterious circumstances. Ma Nator especailly misses the kitten she thought was cutest, because it reminded her of her grandbaby kitty, Maurice. But at least these two seem well, and we hope they'll stick around long enough for her to have them trapped, neutered, and placed at a nearby farm in a few weeks. 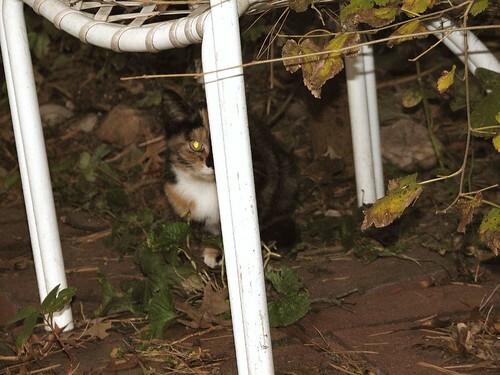 Sorry for the blurriness, but these wary beasts only come out at night, and are prone to slipping away quickly! Hope y'all had a nice turkey day. I'm still stuffed! Hope that you had a fabulous Thanksgiving!! nice that your mom is a responsible feral-cat-feeder. there's no need for any more homeless kitties! good for Ma Nator. gold star. For her feeding the feral strays my Brit friend would say Mother Nator "has put another ruby in her heavenly crown." 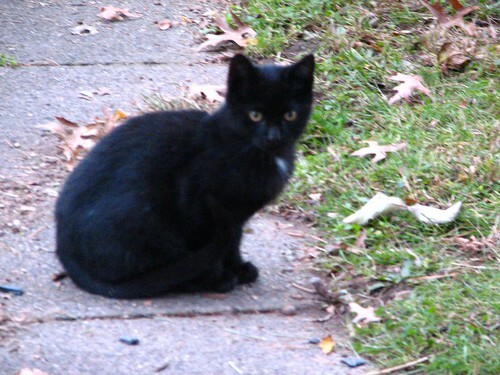 The black cat, except for the spot of white on its chest looks just like our Judi. Lots of Burmese in both Judi and the stray.